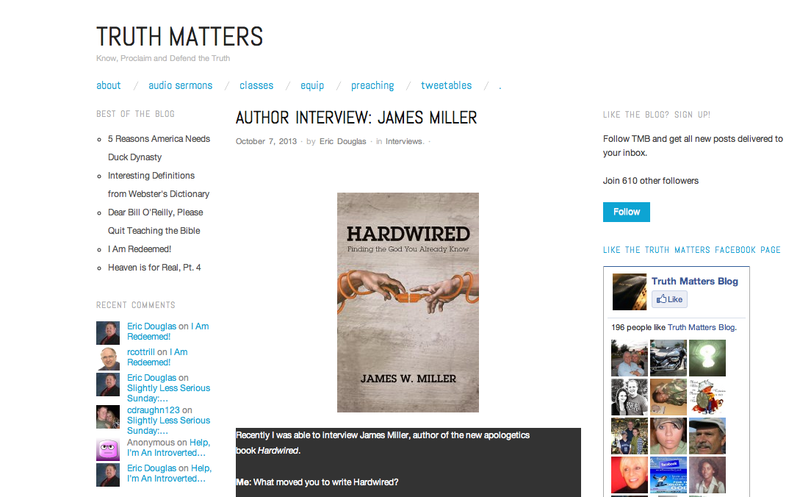 Recently I was able to interview James Miller, author of the new apologetics book Hardwired. Me: What moved you to write Hardwired? James Miller: I have a real passion for students who grow up in the Church but who aren’t prepared to answer the tough questions that will come their way in college. My prayer is that Hardwired will help engage some of their deepest quandaries. I already have two agnostic friends who are reading it. Me: You wrote, “No one has to convince you that you’re home”. I believe that this sums up Hardwired. Could you briefly explain this statement? Although we are “Hardwired for God,” we are left to our own folly without God’s intervention. How blessed we are when our Omnipotent Creator, Sustainer, Savior and Lord crashes into our lives, takes the blinders off our eyes, turns our stone-hard hearts into flesh and rescues us from deep waters of unbelief. Only then do we seek Him. Only then will He be found by us. The “RULES” that were once a stumbling block no longer rule. Our hearts then cry out…Holy, Holy, Holy Lord God Almighty who Was and Is and Is to come… the whole earth is full of Your glory!